A few days ago, the amazing Caroline from chocolateandcarrots.com, posted the best looking brownies I’ve ever seen. And they’re caramel stuffed. I tried holding off on making them until I had a crowd to feed, but I only made it a few days. And I had no crowd. In Germany, brownies are like dry cake (sorry, Germany, but it’s true), so using brownie mix was out of the question. I have a great brownie recipe but I didn’t really want to consume 3/4 cup of butter and white refined flour almost all by myself. 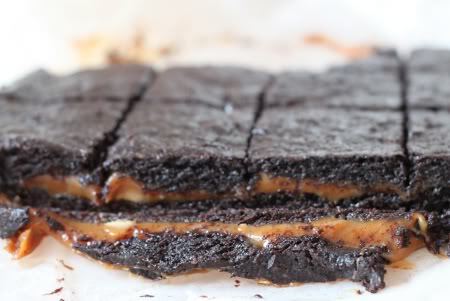 So I created a “healthified” version which is seriously just as gooey and fudgy as normal brownies. No whole grain taste, no oily taste, and you won’t miss the butter. These taste terribly unhealthy, which is always my goal. I first tried this with all olive oil, but I didn’t like the olivey taste. With half olive oil and half canola oil, it wasn’t a problem at all. I don’t even detect a difference between these and my normal recipe calling for 1 1/2 sticks of butter. 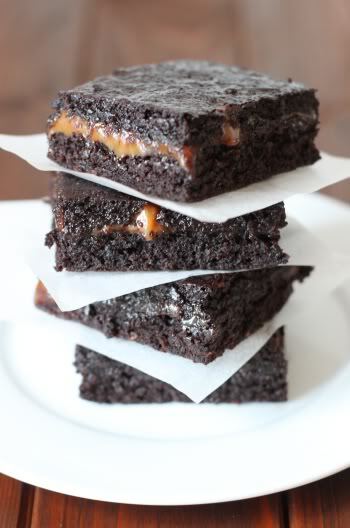 Has anyone made caramel brownies using homemade caramel? Please speak up if you have! I only have two bags of caramel left that I brought back with me from Texas. After they’re gone, these caramel brownies won’t be possible for another year or two and this is very, very sad. I put the fork with the brownie piece on the other brownie for a minute and it was stuck. It was the gooeyness. 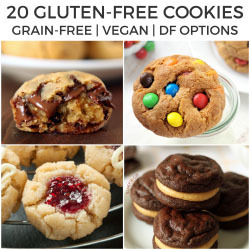 Please do not over mix or over bake these! They won’t be nearly as good and gooey. I made a leaning tower of brownies. I thought it was clever but I’ve been told it looks unnatural. Here it is anyway. 1. Preheat your oven to 350°F / 175°C. 2. Line an 8″ x 8″ (20cm x 20cm) pan with parchment paper, or butter with your preferred method. I like parchment paper because you can just lift the brownies out of the pan and not have to worry about scratching the pan when cutting the brownies. You could use a 9″ x 9″ pan, but remember to remove them from the oven a few minutes earlier. 3. In a medium bowl, beat together the olive oil, canola oil, and sugar. I used unrefined sugar and used a hand mixer in hopes of getting the large grains to dissolve a little. The first time I made these, just mixing with a spoon resulted in some sugar crunchiness in the baked brownie and that’s no good. So definitely use a hand mixer for this step. 4. Add the eggs and vanilla and beat just until combined. Don’t overmix! 5. In a small bowl, mix together the cocoa powder, flour and salt. Add the flour mixture to the wet mixture. It will be really gooey at first and you might start doubting me and my recipe, but just keep mixing until it’s combined. And only until just combined! 6. Spread half of the batter into the prepared pan. 7. Bake for 12 minutes (10 minutes if using a 9″ x 9″). Take out of the oven and let cool. If you used parchment paper, you can just take it out and put it on a cold counter and it’ll be cool in about 8 minutes. If you have to cool it in the pan, wait about 20 minutes. 8. While it’s cooling, make the caramel mix. Melt the caramel pieces and cream or half and half in a saucepan until melted. 9. Spread the caramel mixture over the cooked brownie. Add the rest of the brownie batter on top of the caramel mixture. Use your fingers or a spoon to make sure it’s spread somewhat evenly over the caramel. 10. Bake for another 18 minutes. For the 9″ x 9″ pan people, perhaps about 15 minutes. The middle should be set, but a toothpick probably won’t come out clean even when they’re ready. * With this much sugar, the brownies are just as sweet as normal unhealthy brownies. Feel free to cut back on the sugar! (although I can’t say how it’ll affect the gooey texture). 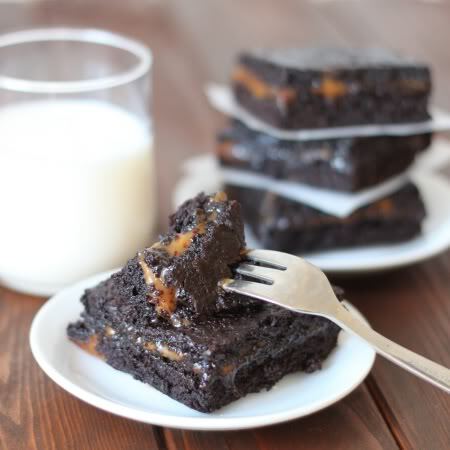 18 comments on “100% Whole Grain Chocolate Caramel Brownies” — Add one! the sugar content is a little high or is that normal? have you or anyone you know experimented with reducing the sugar a little bit? Thank you, the pictures look AMAZING i’m afraid i will eat all of them and ingest all the sugar myself! Unfortunately, that’s normal for brownies. :( But what you could do is reduce it to 3/4 cup! They’ll still be plenty sweet but they won’t be as gooey. Reducing the sugar always makes things more cakey, but the caramel should still keep the brownies non-cakey. At least I think so. :) I hope you’ll enjoy the brownies! Peanut butter filled! :) And thank you for the tip on stodgy. I'll change it right now! By the way my English / Irish teacher colleagues explained it to me, I thought that it'd be a good thing for a brownie. I guess they forgot the negative connotation part. ;) Thanks for your very nice comment and have a great day! These look wonderful! Do you think you could use coconut oil? I recently read that it's the healthiest kind of oil to use in cooking but I'm just working my way around to incorporating it in more recipes! Erin – Ooh… thanks a bunch! I forget about these and the whole caramel problem. I'll go take a look. Thanks again! I've used one recipes for carmelitos (http://www.thesisterscafe.com/2010/03/caramelitos) that uses caramel syrup and adds a little flour in to thicken it up. I haven't tried your recipe, but it might be an okay substitution. 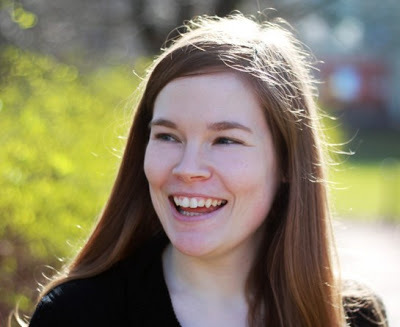 Sarah – Thanks! That's the best idea ever. I actually like dulce de leche even more than normal caramel. 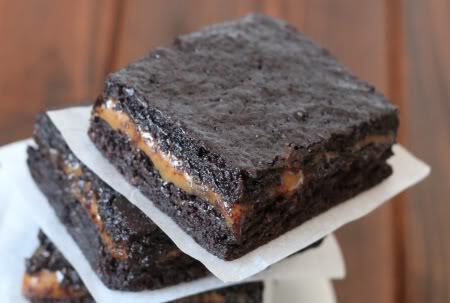 I've made chocolate brownies before with dulce de leche and creaminess definitely wasn't a problem. Thank you so much! I've added your suggestion to the post. It might be too creamy and not set up like melted caramels would, but would dulce de leche work? It's easy to make it yourself with a can of sweetened condensed milk (a.k.a., Milch Mädchen). Becca – Thanks a bunch! :) Your comment has started off my day in a very nice way. Really, thanks a lot! These look almost too fudgey, almost ;). You have a lovely blog here, I stumpled upon it a few days ago after seeing a photo of yours on foodgawker, either that or pinterest, I can't remember. Either way, I like your blog. Wow this looks really sinful :-) I think I couldn't probably eat just one piece!! I have some nutella version brownie to try on my to do baking list but this one seems like a good one to try as well, especially given the fact that I already have some home made caramel :-). I was wondering since the batter has 1 1/4 cup of sugar maybe decreasing it a bit wouldn't be a bad idea right? The caramel is super sweet. What do you think? How sweet where the brownies? Jennie – Aww, but I love high fiber things. Maybe I'll try an Asian food store. They sometimes have unusual ingredients that I can't find elsewhere. Thanks for the info! P.s- the coconut flour- if you can't find it sub for whole wheat flour. No coconut taste in it at all actually- it is very high in fiber. Thanks for the comment on my Pumpkin Spice Bread. I tried a slightly healthier version for my diabetic dad with all whole wheat flour, 1/2 cup sugar, 3/4 cup Splenda, and less water. It wasn't nearly as good. If you decide to healthify, I would only go 50% whole wheat flour or use white whole wheat, cut down to 1 cup sugar, and use all the water.